Synopsis: A traveling handyman becomes the answer to the prayers of nuns who wish to build a chapel in the desert. Did You Know? 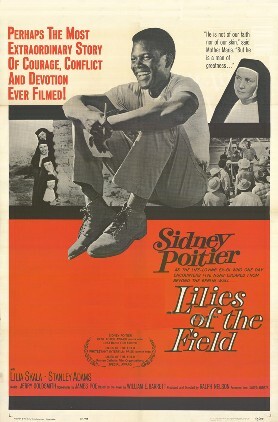 Sidney Poitier was the first black actor win the Oscar for Best Actor. He remained the only one for 38 years, when Denzel Washington took home the golden statuette for Training Day (2001); during that same ceremony, Poitier also received an Honorary Oscar. This is a really sweet film that teaches the value of patience and humility. Homer Smith (Sidney Poitier) patiently teaches the German-speaking nuns enough English to explain to him what they want him to build: a chapel, because they’ve been having to do their Sunday mass outside (in the desert, I might add). Smith is reluctant to do it, because he’s by himself and he knows that it will take a very long time. But then the locals just come barging into his construction site and begin helping; he doesn’t realise this at first, because they only speak Spanish, so none of them says anything to him. The moral of this story is that even with differences of language and religion, people will work together and help each other when it is something important.